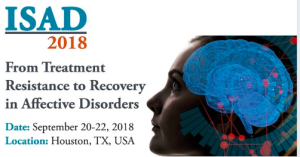 The 9th Biennial Conference of the International Society for Affective Disorders (ISAD) and the Houston Mood Disorders Conference will be hosted by the Department of Psychiatry and Behavioral Sciences and held at the McGovern Medical School September 20-22, 2018. This event, titled “From Treatment Resistance to Recovery in Affective Disorders” , welcomes some of the best minds at the forefront of psychiatry and neuroscience to address the challenges of treatment-resistant affective disorders and explore the most recent advances in treatment. Consisting of keynote presentations, parallel symposia, and a poster session, the conference will discuss clinically relevant findings on topics such as neuromodulation, pharmacogenomics, biomarkers, and other cutting-edge therapeutics, providing valuable updates in a rapidly changing environment.